The area in and around downtown Duluth once included large churches representing every denomination that had a parish inside the city. First Presbyterian is the last standing representative of that era. The Romanesque building, constructed of varied shades of brown Lake Superior sandstone blocks and adorned with carvings and stained-glass windows, seems to erupt from the steep hillside of 3rd Avenue East. Its corner bell tower reaches 125 feet above 2nd Street, and inside the church there’s room enough for 1,000 parishioners. The building features Tiffany stained-glass windows by Duluth’s Anne Weston. 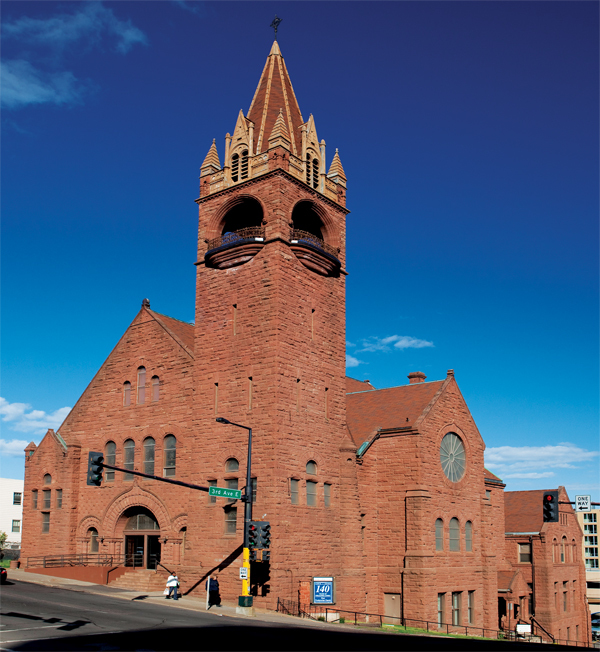 At the time it was built, the church was at the heart of Duluth’s most affluent neighborhood. When parishioners moved east, attendance declined, but it is still a functioning church.